THOUSANDS of our fellow creatures . . . are this very moment existing in a state of slavery.” So wrote evangelical Richard Oastler in his damning indictment of 1830s Britain. He charged the nation with sacrificing its children at the altar of avarice. Thousands of children between the ages of 7 and 14 were daily being compelled to work in the Yorkshire worsted mills from 6:00 a.m. to 7:00 p.m. with only one 30-minute break. As this situation became known, Christians, especially a group of Yorkshire evangelicals, began campaigning vigorously for reform. Young children had traditionally been employed in large numbers in agriculture and domestic work. But in the 1800s, they began working in stiflingly hot and unbearably noisy factories with their soulless discipline and order. There were no safety regulations, and financial penalties and beatings were imposed for the slightest slip or misdemeanor. Accidents and deaths were all too common. Children were not, however, exploited only in England’s “dark, satanic mills.” They worked in gangs in the fields, often traveling miles in order to get to work. They were used in coal, tin, and copper mines, crawling on all fours like animals, pulling heavy loads. They also made bricks. The use of young boys as chimney sweeps is well known. Many returned from work with their arms and knees bloody, and deaths from suffocation in the chimney were not unknown. Lace making provided employment for girls. Many started to learn at the age of 5 or 6. They worked in confined spaces, in suffocating heat in summer and miserable cold in winter. Payment in goods was a widely accepted practice, forcing the girls to use the employer’s shop, paying high prices for inferior goods. Evangelical reformers were particularly concerned about the immorality that such working conditions encouraged. There was little parental supervision and children of both sexes worked and sometimes slept in close proximity. Girls and boys in the mines were often lowered into mines together. Many of the girls worked naked to the waist alongside completely naked men. Child prostitution occurred on a casual basis in most work places. For many young girls, it became a full-time job. The material benefits were often better than anything children could possibly earn otherwise. Parents often had little choice over such cruel treatment of their children. They were in desperate need of more income. Financial needs dictated that children, if they were sent to school at all, were removed at an early age so they could add their pittance to the family earnings. Orphans were in an even worse position. They became the property of their employer and were entirely dependent on his good will. In addition to Richard Oastler, evangelicals such as George Bull, an Anglican priest, and Michael Sadler, a Member of Parliament, also became outraged at all this. They made great sacrifices to bring about needed changes. John Wood, a devout Anglican who owned the largest worsted mill in England, decided to lead by example. In 1825 he instituted a ten-hour day for his work force and built a church, vicarage, and school next to his factory. Even more sacrificing was Oastler: his campaigns for social reform eventually led to the loss of his job and four years’ imprisonment for debt. These reformers quickly realized that employers would have to be legally forced to look after the needs of children. However, Parliament was reluctant to interfere in the workings of the economy, and even parliamentary decrees had their shortcomings. An 1802 act prevented apprentices from working more than 12 hours a day; an 1819 act prevented the employment of children under the age of 9. But these acts achieved little because there was no provision for inspection and enforcement. Reformers decided that progress would be made only with a highly organized public campaign. Committees and mass meetings were organized. Oastler’s fearless oratory and his damning 1830 article, “Yorkshire Slavery,” published in the Leeds Mercury, brought factory oppression to the notice of a wide public. Bull spoke at many meetings throughout the country and was a prolific pamphleteer. Sadler became the parliamentary leader early on, as did Lord Shaftesbury later. Over the ensuing decades, legislation reduced the work day to ten hours for children, provided for at least some of their education, and most importantly, appointed inspectors to enforce various acts. Penelope Carson is a free-lance historian from the United Kingdom. What 19th-century British reformers teach us about Christian social action today. 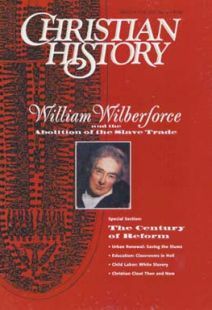 More information on William Wilberforce & the Century of Reform. Little-known or fascinating facts about Eastern Orthodoxy. Welcome to one of the most exotic journeys Christian History has taken.